Insidious Chapter 3: Enter the Further! Upon entering the immense exhibitor hall of C2E2 (Chicago Comics & Entertainment Expo) we made a beeline for our pre-scheduled Insidious: Into the Further 4D Experience. Despite the size of this event and its countless attractions, our destination wasn’t hard to find. Located at the far end of the convention, our destination was two large truck cargo holds adorned with an Insidious: Chapter 3 poster and converted into a thrill ride. The previous Insidious films were both somewhat rides in their own right and, in my opinion, highly satisfying. Their original stories (a novelty in the horror world these days) were chock full of frightening imagery and effective atmosphere making it a personal favorite. When I saw this amazing opportunity to experience these films in a whole knew way, and that it was coming to C2E2, I knew I had to get on board. This was also a great way to gear up for the new film opening in theaters this Friday. The experience being in 4D meant you could experience the films almost as participant, rather than a mere viewer and what horror fan would ever pass up on that? We entered the trailer and, even before our “ride” officially began, immediately became immersed in a different and terrifying world. The Insidious films have a distinct atmosphere and this room captured it perfectly. It was like visiting a musty antique shop or a home that hadn’t been redecorated in a hundred years. It was highlighted by aged furniture and items that caused you to instantly forget that you’d just walked into a truck! There was so much eye candy, I honestly didn’t know where to look first. One thing that did catch your eye rather quickly was a life-size human figure sitting in a chair and wearing gas mask like the one Elise used during the seance sequence in the first film. Another homage to the movies was a set of “ghost dice” on a table, like the ones used to communicate with the dead in the last entry. At the end of the room was a podium where a woman would alert you when it was time to enter. Although we all went inside together, the experience was individual and her job was to let you know what room you’d been assigned when it was your turn. Once it was your turn, you’d walk through a door and into a dark, creepy hallway before an even creepier woman directed you to your assigned spot. Mine was dark and embellished with more retro goodies but there wasn’t much time to take anything in as I was instructed to sit in a chair and the woman fitted me with one of those aforementioned masks (complete with specialized eye gear). Once secure, I opened my eyes and saw Elise from the Insidious films sitting in front of me…and I mean sitting in front of me! The effect was such that it looked as if you were really there in the room with her and this, alone, made it all worth it. You could even turn your head from side to side and see the full spectrum of the room in vivid detail. Elise’s job, like that in the films, was to explain what those less schooled (in this case, ME) in supernatural terror were dealing with. Unfortunately, Elise wasn’t the only presence and even though my eyes were locked on hers, I couldn’t help but movement on either side. This would be in the form of a shadowy figure reaching through a window (and through the fabric of the drapes I might add) along with the sounds of whispers! After a fair warning from Elise, you are left to your own devices leading up to a grand finale of sorts that was more satisfying than any haunted house I’ve visited in a long time! After it was over, you were escorted out of the ride and into the light of the convention hall which, let me tell you, was every bit of a contrast as Dorothy leaving Kansas for Oz. This experience has been appearing at a multitude of conventions and hot-spots around the country. Should it arrive in your neighborhood, I urge you to make a point of experiencing it for yourself. I should mention that you do NOT have to be an Insidious fan to enjoy it, but it will likely have you wanting to give the previous films another gander along with a trip the the theater this weekend. Coming Up…The Cosplay of C2E2! 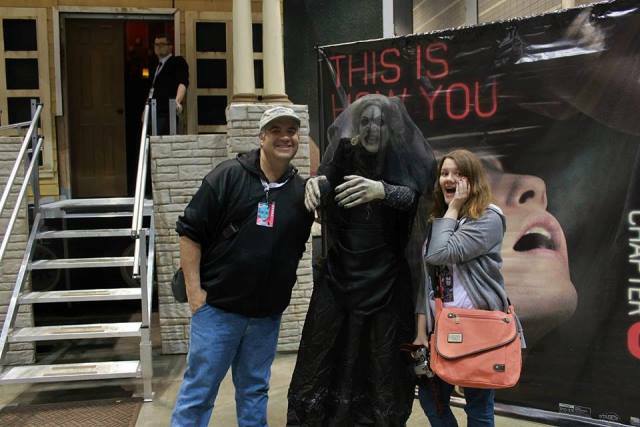 This entry was posted in Supernatural and tagged C2E2, INSIDIOUS, Into the Further 4D Experience. Bookmark the permalink. ← Chicago Comics & Entertainment Expo (C2E2) 2015!